A new masterplan is unveiled this week for the Weaver Square area of Northwich, to create a vibrant new neighbourhood for the town to complement investments made to date in the development of Barons Quay and public realm improvements on Witton Street. The masterplan sets a vision for bringing new residential development and a public services building to Northwich. It also features a flexible, multi-use public area that could be used as a community space for live music and cultural events as well as a market and independent traders’ area, all which figured highly in the feedback during the first round of consultation. Announcing the launch of the consultation, Cabinet Member for Economic Development and Infrastructure, Councillor Brian Clarke, said: “I’m sure local people are going to be delighted when they see the new plans for Weaver Square which builds on the consultation we ran in 2016. “This is a once-in-a-lifetime opportunity to create a really special showcase area for our town. I would encourage everyone to get involved and have their say. Now local residents are being encouraged to view the plans and have their say online ahead of consultation events planned for June. 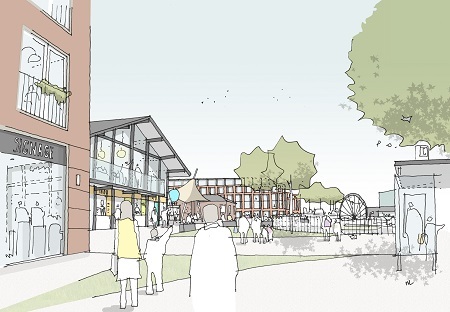 The plans can be viewed on the Council’s website at http://inside.cheshirewestandchester.gov.uk/get_involved/consultations/weaver_square_regeneration, where there is also a link to an online survey where local people can leave feedback. There will be a drop in session on Wednesday 20 June from 3pm to 6.30pm at Memorial Court, Northwich where people will be able to see the plans and proposals, ask questions and leave comments. In 2016, more than 1000 people responded to the initial consultation with key stakeholders and the local community to gauge what improvements people wanted to see in the development area. Feedback from the first stage of the consultation has shaped the proposed masterplan. Weaver Square is a major part of the wider regeneration of Northwich town centre and the proposals will add further value to Northwich and complement the existing offering of retailers, businesses and services across the town. The Council has issued a demolition notice for part of Weaver Square to help pave the way for new development opportunities. PSP Cheshire West and Chester LLP, which is a partnership between Cheshire West and Chester Council and Public Sector PLC, are managing the master planning process on behalf of the Council. Projects and initiatives developed and progressed by Public Sector PLC on behalf of local authorities aim to maximise both the return to the Council and community benefit.